Mexican officials who oversee migrant shelters in Juárez, Mexico, said they’ve seen more Cubans arriving since late last year. Ciudad Juárez, Mexico — Three months after they left their native Cuba, Victor Paumier and his family walked into a sports arena-turned-shelter in Ciudad Juárez carrying everything they owned in backpacks and plastic bags. To get to the northern Mexican border city, they had traveled through all of Central America and much of South America. Along the way, they survived a car accident in Peru and a week in the thick jungles of Colombia and Panama. They slept on riverbanks and in cheap hotels, working odd jobs to support themselves. The family’s goal is to request asylum in the United States. They said they fled Cuba for political reasons. Now, they join a long line of migrants spending weeks in Mexican border cities as U.S. Customs and Border Protection restricts the number of asylum-seekers allowed through ports of entry each day, and Mexican officials and volunteers scramble to create more shelter space. The Obama administration ended what was known as the "wet-foot, dry-foot" policy, which gave Cubans a unique status — any Cuban who stepped foot on U.S. soil could stay in the country and obtain a fast track to permanent residency. That is no longer in place, though under the Cuban Adjustment Act, Cubans who are already on U.S. soil — whether they came in undetected or overstayed a tourist visa — can adjust their legal status if they can keep a low profile for one year and one day. But in recent years, a growing number of new arrivals, who risk being returned to Cuba if they are caught, have opted to travel to ports of entry and apply for asylum. During the 2016 fiscal year, judges made decisions in 59 asylum cases filed by Cubans. In 2017, that number jumped to 245, according to Syracuse University’s Transactional Records Access Clearinghouse, or TRAC, database. Last year, 455 Cuban asylum cases were decided — with about six in 10 resulting in denials. 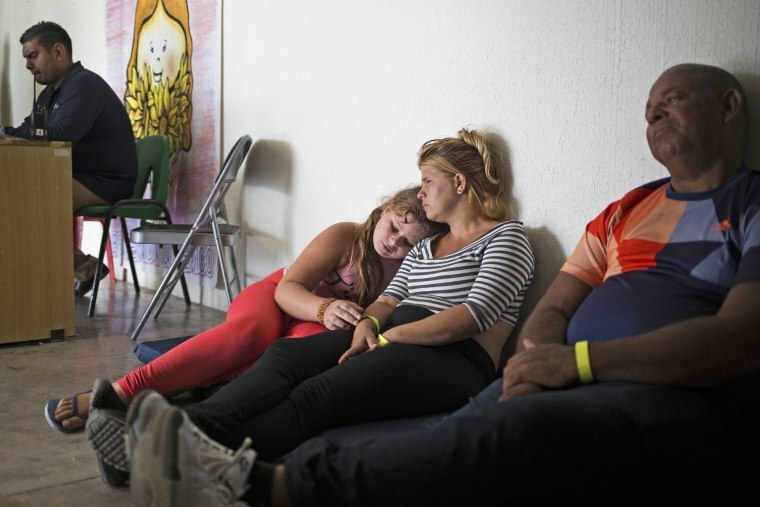 Late last year, as the Paumier family made plans to sell their home in Havana, asylum-seekers arriving in Juárez faced a one- to two-week wait to enter the U.S. But by the time the family arrived three weeks ago, estimated wait times had jumped to two months. Almost 500 people were registered at the sports complex shelter. Although Central American citizens make up the majority of people seeking asylum along the southern U.S. border, Mexican officials who oversee migrant shelters in Juárez said they’ve seen more Cubans arriving since late last year. Many Cubans in Juárez said they chose to travel there after hearing it’s the safest border city from which to request asylum. In recent weeks, news reports have detailed the illegal detention, kidnapping and extortion of migrants arriving in Reynosa, a city hundreds of miles east of Juárez. But last year, the Trump administration introduced a tactic known as “metering” or “queue management.” Under the new policy, border patrol agents started to turn people away at ports of entry, stating that they only have room to process a limited number of asylum-seekers per day. At Gimnasio de Bachilleres, the high school sports complex in Juárez’s central park, officials have transformed a basketball court into a makeshift sleeping area to address the increased need for safe places to house asylum-seekers as they wait to cross into El Paso, Texas, though the administration announced this week that migrants seeking asylum in El Paso will now have to wait in Mexico. The temporary shelter opened last month after Casa del Migrante, the city’s main shelter, reached capacity. About 80 percent of the roughly 150 people now registered at the gym are Cuban. As Paumier waited outside the shelter for word on whether there’d be room for his family, volunteers handed out avena (oatmeal) and saltine crackers while his grandchildren played nearby with rocks. His journey, he said, started in early December with a flight from Cuba to Guyana. The South American country allows Cubans to enter without a visa as long as they have round-trip airfare. But Paumier and his family had no intention of returning to Cuba. Instead, they crossed into Brazil and then Uruguay, looking for work to help finance their trip. They tended bar and hauled bags of coffee — any kind of work they could get off the books. Then they crossed back into Brazil before continuing on to Peru and Ecuador. They spent Christmas in Colombia and then continued north to Central America. Paumier’s granddaughter, Jani, turned 12 in Costa Rica. The route the Paumiers took became a popular one for Cubans between 2015 and 2016, according to Jorge Duany, director of the Cuban Research Institute at Florida International University. As President Barack Obama worked to improve diplomatic relations between the U.S. and Cuba, thousands of Cubans started to make their way to the southern U.S. border, often starting their trips in Ecuador. Since then, Duany added, many Cubans have opted to migrate to Europe or Latin American countries. Last year, the U.S. started processing Cuban immigrant visa applications at the U.S. embassy in Georgetown, Guyana, leading more Cubans to travel there. Paumier said he first visited Guyana last year to buy shoes and clothes he could resell in Cuba for a small profit. After two trips, he and his son decided to fly to Guyana a third time and then make their way to the U.S.
More than 22,000 Cubans entered Guyana in the first half of 2018, according to a local news report that cited a government official. Of those who entered the country, about 6,000 did not file departure paperwork with immigration authorities. For Paumier, traveling thousands of miles through unknown terrain was the hardest part of his journey. But soon, his family will face a different kind of challenge. The odds of making a successful case for asylum are not great, according to Allen, the immigration attorney. He estimates that about seven to eight of every 10 Cuban asylum-seekers are denied. This reporting was supported by the International Women’s Media Foundation as part of its Adelante Latin America Reporting Initiative. Carolina Hidalgo is a reporter and photojournalist based in St. Louis, where she covers immigration and criminal justice reform issues.